April | 2015 | Leadership. Locomotion. Life. April 2015 – Leadership. Locomotion. Life. Coach Ken Axford coaching elite (Hunter Kemper in orange cap, near side). Good swimmers hold their form when they’re tired. Cycling mentality: race your way into shape. In triathlon if you do that you race your way out of shape. All elites on long runs are doing the cycle of 9 minutes run, 1 minute walk. Walking is also worked into tempo runs as well. There is always dynamic warm up before running. One brick a week generally works well. Workout plans done based on time not mileage. Important for youth to experience racing at high levels to get used to the pressure and to learn how to get to the place where the pressure is more of a non-factor. In assessing an athlete’s capacity to be an elite, you must consider: Do they have the time for it and the ability? You bring on athletes to a squad for different reasons. Must think about the chemistry of the group. Compatibility is very important. 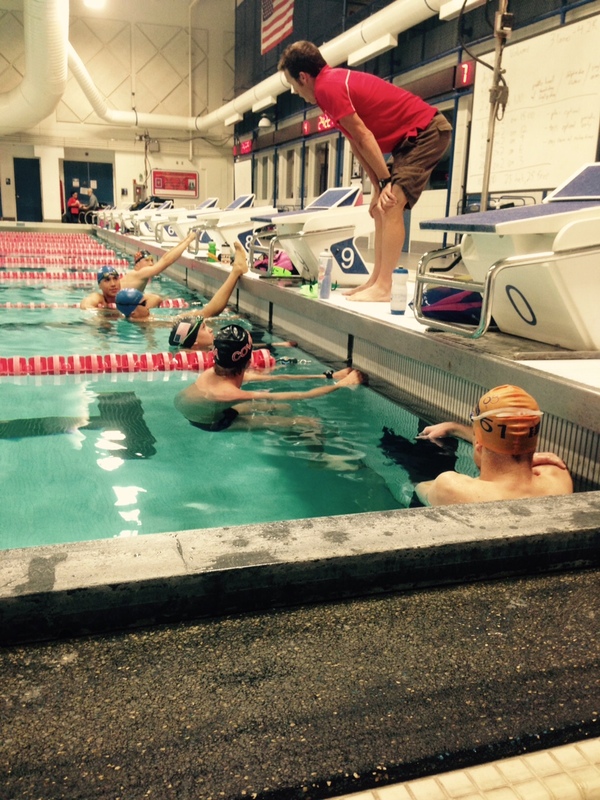 Discussion around why the US’s best ITU athletes are all coached by International coaches. 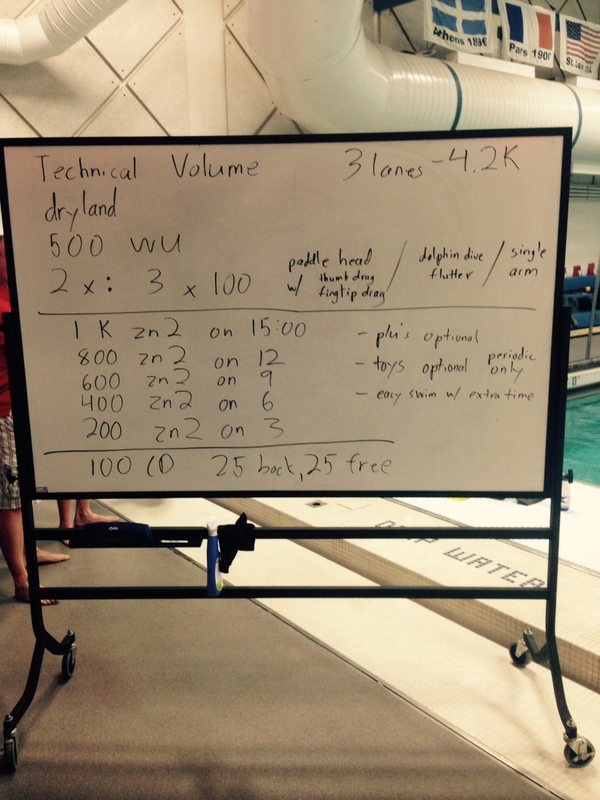 US triathlon coaching education is behind the curve. There is support available ($) for those wanting to develop elite squads but it has to be 99% your initiative to start and to maintain it. In running squad you must balance Team Dynamics vs. Individual Needs (with various adaptation rates) – all makes for a tough balance. Case Study of Elite Britain Tri Team in Leeds: atmosphere of extreme competition; exceptional athletes w/ exceptional coaching; exceptional attention to detail (e.g., Malcolm Brown leading up to 2012 London games, once a month he would go to the hotel the team would be staying in during the Olympics to meet the staff, get used to the food, stay a night, etc. – went to great extents in attempt to “control the environment”! ); use Alter G for speed work; would bring in outside athletes to “stir the pot” that were great champions to challenge the team; Always training in rain and cold (mental toughness); no culture of ENTITLEMENT; intentional effort to empower the athletes to be decision makers (discussion around the controversy of when Johnny took his penalty during the Olympics); Manages the “noise” around the athletes; Alistair has a friend be the filter of all communication and only brought him the important stuff; feeling of we are “in it together”; always show confidence even when you’re not; team went to Switzerland and higher altitude; “old school” mentality: no power meters so athletes could not obsess over it. The Alistair and Johnny dynamic was one of love but extreme competition. Before Olympics, Alistair was in a boot for 10 weeks and only did 3 races and 10 run workouts before winning the Gold Medal. He did lots of aqua jogging and used the Alter G.
You need to plan – you need to be flexible – and you need to change it up! It’s important to create a plan and to have confidence in it. Include your athletes in the planning and remember to be flexible with it. There is no such thing as spending too much time with the basics. There is no detail too small. The dosage of hard efforts is important to get right (within the workout, within the week, etc.). Before Gwen Jorgensen was full-time triathlete, MM remembers being at the airport with a team of professionals and the other athletes were napping and Gwen at the time was still an accountant so she was working. This impedes ability to recover! General rule of thumb is not very much taper with elites because they will detrain very quickly. Bike skills one of the most important things to plan for in ITU racing. What type of RESPONDER is your athlete? Don’t pigeon-hole your athletes into these categories as they will move through them sometimes as they progress. Concept of non-linear training is that you never have one system that falls behind. Keep the critical energy systems moving year-round. One drawback to traditional periodization is that it’s an oversimplified planning model. No one best model for all individuals. Laying out a yearly plan is not derived from scientific research. Periodization is not a science. Apply the principles of planning and “change it up” frequently. Look up Jon Kailey – Periodization and Paradigms in the 21st century – most important thing is to CHANGE IT UP! Conclusions: high volume and threshold is the foundation of the plan all year. Nordic ski and biathlon German model of periodization: similar conclusions of the need for aerobic volume and interval training. As a reminder, these notes are not comprehensive; the merely reflect what I personally found most interesting or helpful. Enjoy! The athletes need the OW simulation in the pool, not only for specificity but for CONFIDENCE (e.g., particularly in knowing they can get out fast and hang on to the pace). Some athletes don’t swim on Saturday because they do fine on 5 days a week and are coming out with the first pack very easily. It’s important to remember the principle of individuality though; for example, Katie Hursey leads the ITU females out of the water and swims only 3 days a week. But when she had a bike crash and broke some ribs, she upped her swimming to 5 days a week so that she could maintain and then increase her aerobic capacity. KA mentions this is not a formula for every squad; it’s just what works for his group, given their ages, maturity level, school schedules, etc. Currently, athletes preparing for the ITU race in Monterrey are acclimating by starting trainer rides with sweatshirts and other layers and then de-robing as they get excessively hot. For the ultra-committed athletes, he might have them set up their trainers in the bathroom with a hot shower running to simulate hot AND humid conditions. On the high end, some ITU coaches are commanding close to $800 to $1k a month and on the low end, $200 a month. AURUM project – goal is to bridge the gap between Junior/Collegiate Elites and the USAT High Performance pipeline. How can Youth/Junior programs compete with swim and run scholarships that athletes are being offered? How can those athletes be kept in the pipeline with triathlon as their priority when the allure of these scholarships is so strong? From Andy Schmitz: Have a thoughtful conversation with the athlete and the parent. What is the athlete’s priority? There are many considerations, with financial only being one of them. It must be the right environment, with the right style of coach, at the right time, with the right student body, etc. USAT Coaches can help Barb in identifying athletes across the nation. A simple email with a link to a recent race is great. Know the standards, know the testing protocols, and know the goal of CRP: Olympic medalists. It’s not just number crunching with the swim and run assessments – there are many “intangibles” to consider: Is the athlete coachable? Organized? Do they respond quickly? Do they ask good questions? Do they have to be motivated to do a simple recovery run? Can they respond well to a long email she sends them? (If not then it’s a good “weed out” process). The Ideal Recruit: swimmer from age 8 to 15 and then in high school at age 15 switch over to running and improve skills to be good enough to run in college. Some mountain biking (or cyclocross) is a plus to develop bike handling skills. This is the ideal situation. Steeplechasers are now being looked at as they tend to be a bit stronger than the distance-only folks and these athletes tend to be good on the bike as well. The fatigue index of the best runners is somewhere between 3% and 5%, when doing the assessment of [400m all out, 7-minute rest, then 200m + 1600m]. As of late, USAT has leaned more towards recruiting the runners than the swimmers. Men take longer than women to develop: women can race WTS within a year of being in the sport while male runners will spend more time developing the swim and bike. Referencing The Lore of Running, by Tim Noakes – There is a chart, given optimal body weight and fitness, which predicts the potential that an athlete can reach for running events of varying distances. (The chart may also account for differing weather conditions and other variables). The Top 30 Men for a sprint race ranges from 4:40 per mile to 6:07 per mile. The Top 30 Men for an Olympic race ranges from 5:31 per mile to 6:07 to mile. The Top 15 Women for a sprint race ranges from 5:29 per mile to 6:27 per mile. The Top 15 Women for an Olympic race ranges from 5:58 per mile to 6:27 per mile. The athletes that do the best on the run tend to fade the LEAST, with a 3-5% fatigue ratio (roughly 10 seconds per mile, even though the data can be misleading as it’s more common for the first two miles to be similar in time with the third further off). Negative splitting on the run is not common in Continental Cups. The Top 30 Men for a sprint race ranges from 4:40 per mile to 5:14 per mile. The Top 30 Men for an Olympic race ranges from 5:00 per mile to 5:24 to mile. The Top 15 Women for a sprint race ranges from 5:14 per mile to 5:48 per mile. The Top 15 Women for an Olympic race ranges from 5:38 per mile to 6:09 per mile. In WC’s it’s not about “fading the least” as much as it is RACING THE RACE. More tactics come in to play, so that doesn’t always mean racing the “fastest” race. The Top 30 Men for a sprint race ranges from 4:40 per mile to 5:19 per mile. The Top 30 Men for an Olympic race ranges from 4:43 per mile to 5:09 to mile. The Top 15 Women for a sprint race ranges from 4:53 per mile to 5:51 per mile. The Top 15 Women for an Olympic race ranges from 5:21 per mile to 5:48 per mile. Going from WC to WTS racing on the men’s side takes about 2 years; on the women’s side it could take as little as 3 months. Case Scenario: How did your athlete originally get to a 17-minute 5k? Was it volume or was it speed? If we want to get back to that speed, do we use the same approach as before or different? Considerations for effective running: head position, arm carriage, forward lean, foot contact position, and range of motion for hips, knees, and ankles. Many coaches become a jack of many things and master of nothing. Build a team of experts around you and be a master of something and don’t feel like you have to do it all yourself. Speed before distance. (When LH polled 6 elite ITU high performance coaches in her network, 4 answered speed before distance, 2 answered distance before speed). It’s harder to run off a volatile bike than off a steady bike (i.e., the more steady they can keep the LT [and the fewer spikes in VO2 and peaks in power] the better). Athletes that only ride the trainer tend to be more inconsistent on the race course and have higher fear factors on the road. Peripheral elasticity is critical in turning big engines into running speed. Neuromuscular training is very important! Make sure you use a device that measures the power NOT that calculates it. Why use power? To track and assess training and racing. Power meter prices are now coming down. Stages may be most affordable now. Interesting notes: If a professional in a race has a TV camera on him/her (via motorcycle or car) then his/her power meter may not work (it will cut in and out) because the signals get crossed. At the velodrome, wired power meters are better than wireless because of all of the devices in the crowd that will potentially cross signals. For intervals, using heart rate is an inferior method when compared to using power. If you have different power meters on different bikes, then you need to test your power on each bike. LH always does blood LT AND a field test to create custom wattage zones. Being inefficient on 180 degree turns will require more wattage to then keep up with the pack and thus negatively affect the run. Higher cadence and limiting power spikes (to only “when necessary”) are keys to running optimally off the bike. Example Race Preparation PowerPoint (for Gold Coast): pictures (LH watches TV coverage and takes screen shots AND/OR uses Google Maps) of the start line for athletes to visualize (including counting how many steps it takes to get to the water), pictures of each buoy and how wide the turns are, surface quality of the roads, sighting landmarks, # of turns on bike course and at what angles, elevation charts and visuals of each spike, landmark at which there is 60 seconds to go in the race, and other detailed course reconnaissance. Details details details! We don’t test for the sake of testing. We test so that we can apply and use it in some way in the future. The results of testing should be able to tell us something. The first rule of testing is to do it often and consistently so that eventually it’s just “another day” for the athlete (and so that test anxiety is a non-factor). Application of the test – Move forward with the plan? Change training? Add in more recovery? Change system focus? Goal of LAB testing: be able to control almost every variable (closed environment). Do lab testing on back-to-back days to minimize the loss of training that occurs due to spreading out the tests. Heart rate tends to be higher when testing outside vs. testing in a controlled lab environment. Benchmark testing: not always consistent (the same test every time) but done in a testing environment. LH makes a year calendar mapping out lab testing, fielding testing, benchmark testing, acclimatization, and racing. BSX evaluation: Good noninvasive test but doesn’t provide all the information along the way (during the test) that she likes to analyze. It currently only provides break point (and an accurate one, at that). She thinks it might be better applied in a training (not lab) environment. Showed how she uses VO2 max and LT tests to determine how training plan might be altered based on the results of these tests (i.e., more LT vs. top end work). Many times when testing reveals that the athlete is not improving, the athlete is doing more training on his/her own which is getting in the way of the actual improvements. Body composition is really taboo among athletes and coaches, and that’s a shame. When athlete is in a good state of mind for the testing, monitoring is very advantageous. If you’re on a bike or run focus and you’re not seeing improvements, then after a dedicated recovery phase, you ought to be seeing improvements then. Perhaps age 15 is the first time a junior might consider doing LT testing and even then, maybe once a year. Telling someone to hold a certain power number during an LT test is NOT going to produce reliable data! You need a CompuTrainer or KICKR so that you can control the wattage. This week I am one of seven coaches nationwide fortunate to attend a unique offering from USAT at the Olympic Training Center in Colorado Springs, Colorado. While the knowledge is fresh on my mind, I want to share with you some key points or “quick hits” about what we learned during today’s session. I tried to capture the essence of each topic and write down the items I personally found most interesting and helpful. Knowing the different between ITU points and ITU rankings is paramount. It is interesting that more emphasis is put on Grand Final (GF) than on the Olympics from the athlete perspective; this is mainly due to financial considerations (500k at GF vs. 25k at OLY). It is a 10-15 hour-a-week job just to manage the points and the rankings for the US team alone! Going from CC to WC to World Triathlon Series (WTS) and then GF and experiencing this success at each level is so important because of the CONFIDENCE it brings. Current RIO 2016 Strategy: Men’s US Olympic field not as deep, so for the 3 available Olympic spots, coaches will pick one person to win and then 2 to support as domestiques – at the Olympic level it’s a team sport not individual! Many elites do not like this. However, women’s field much stronger and can pick three athletes to contend. Steve Kelley is great to work with and one to know for anything related to youth/junior development. The Olympic Training Center uses the upgraded version of Ubersense. Video is the most important tool you can utilize as a coach. Every training session has a purpose and objectives (e.g., A recovery run (4min run, 1min walk) with a focus on arm mechanics – Athletes always have a FOCUS for each s/b/r set). Not as important with other populations perhaps but a necessity with elites. Sessions must be designed around improving technical skills, efficiency, economy, and other factors. Have an athlete watch a video of another athlete that is doing something well; then immediately have that athlete close their eyes and visualize doing the same skill from multiple angles. HIGHLY, HIGHLY EFFECTIVE. Within a session, pull athlete out of water and use black-out goggles to enhance visualization experience. Show side-by-side video analysis of one athlete with another, and side-by-side with the same athlete showing today and 6 months previous – great way to show progression and to give feedback. Look at run mechanics after a hard bike, after a hilly bike, with regular run shoes, with racing flats, etc. Form changes (sometimes drastically) after all of these situations (and in different ways), and so there are lots of areas to show the athlete where improvements can be made. Shoe selection – take video camera to run shop and if a treadmill is available, take multiple angles with 4-5 pairs of shoes to determine ground force reactions on physiology, susceptibility to pronation, etc. Keep a video library (one for skills/drills AND one for each individual athlete). Create key points to focus on with voice-over. Make sure that you value your service and charge accordingly for video as most coaches do not offer this service. Video is extremely useful for buy-in on getting athlete to incorporate recovery techniques (stretching, etc.) because you can show them how their gluts are shutting down or alignment issues, etc. Each style of wetsuit has different drag, so video each wetsuit and the impact on form to see which is best. Katie Hursey was terrible on handling the bike in 2013 and would fall down at 180 degree turns. She got better at OTC, now on the ITU circuit she is really good. Showing the youth and juniors that you can get better at skills by using Katie’s videos as proof and as motivation. There are significant benefits to drafting on the run. Use video to show athletes how they are or are not doing this properly. Video is also a great way to see if the changes we are asking athletes to make are actually working; we are not perfect so not everything we suggest is going to result in the performance we had in mind. Swim – video athletes sighting and then without sighting – this is very race specific. 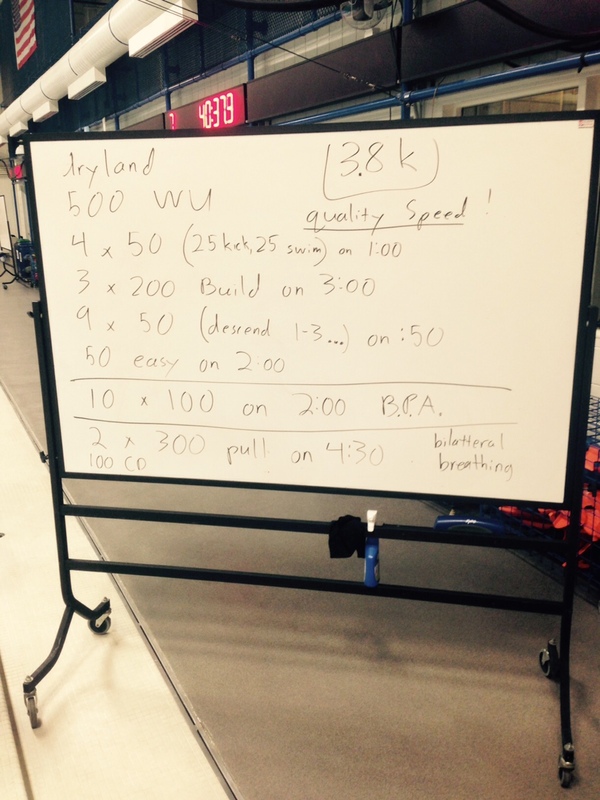 Every swim workout Chris writes has sighting in it – e.g., 6 times per 50 for a 500). Bike – video athletes on the trainer and the open road, before and after a hard swim. All of his elites race crits once/twice a week – it’s a very important skill set. Compare power data with more and less hip angle (tweaking bike fit) and the impact it has on the run. Run- video athletes on the treadmill, road, and track, in training and racing shoes, and before and after a hard bike. Summary : Video Analysis is a continual, integrated process dealing the following five areas – preparation, observation, evaluation, feedback, monitoring. The #1 way of advertising after 15 years is still: WORD OF MOUTH. Be nice to people and do a great job and others will find out about you. Writing an article is better advertising than paying for an ad in a magazine. Credibility will allow you to charge more but be aware that when you do, you must BE MORE yourself in order to justify the jump. It’s possible that you don’t know why you’re clients really stay with you…you think it’s the results but don’t underestimate the power of the relationship, the friendship, the hand-holding, the listening – these reasons are why people will STAY with you. Along his way to the goal of 100 clients, he imploded at 53. Since then he’s gone from 53 to 30 to 20 to 15 and now less than 10. Of course he charges more now but with 53 clients he had a strong relationship with about 5-6; the rest just floating out there, so he advises against doing this! 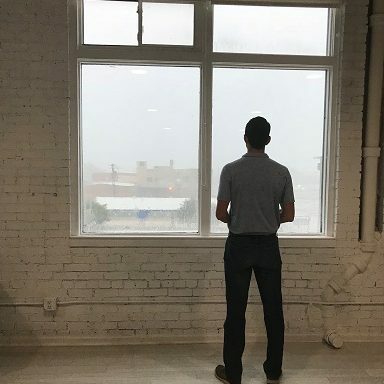 Mike writes training plans for Training Peaks – soon he will have more than 300 and is moving towards his goal of $10k/month. A business mentor challenged him to list 50 things he could do to increase his revenue (i.e., 50 different ideas). He got to 23 and then was stuck. The mentor said, “What about ‘buying CTS’?” The point is not about CTS but rather, to dream big and think outside the box of things you can do to have a thriving and growing business. You have to take a step back from your business (out of the minutia) in order to take two steps forward. Read the E-Myth. What separates you from the next guy? Product differentiation very important. Be able to justify why you’re more expensive. Sell others on VALUE not price. Weak sales people usually depend on brochures and websites (as opposed to explaining to people what the actual value is). The favorite and ONLY station your client listens to is WIFM – What’s In it For Me!! You can be Wal-Mart (everything to everyone) or you can be Mercedes-Benz (sell to a specific person). Over 95% of d3 clients are executives, which makes it easier to get more executives because they hang in the same circles. Google “Hedgehog Concept” from Jim Collin’s book Good to Great – Find your “sweet spot”. What Mike did at the beginning for a newsletter was to force himself 1) to write 2 articles a month…now after 12 years lots of content (500+ articles). And 2) build relationships. Those two things are critical. Write down the type of athletes you want to coach. Gotta know where you are going. Follow your passion, the money will come. Mike Ricci’s style – loves discipline and structure and that’s what brings out the best in his athletes. Must find what works for you and what is empowering for the athletes. The “ability to inspire” is one of the most important leadership qualities to have. Coach and athlete philosophies must align. You must convince the athlete that what you’re going to do will work. This is a constant process and requires a great relationship with the athlete. Treat everyone fairly, but don’t treat everyone the same. Once a Runner – great book to put on your reading list. Jordan Spieth (21 years old) won the Masters yesterday. There’s something about the humility of this young man I really like. Ellie is Jordan’s 14-year-old sister with neurological disorder putting her on the autism spectrum. When reflecting on the legacy he will leave, Jordan said “I’m a professional golfer, but I want what I do on the course I was to be secondary to what I do off the course.” And I believe him. What Jordan’s mom said rung my bell a little bit. She said that one of the reasons Jordan is successful is because he realizes that real life isn’t at the Masters. He’s a great golfer but has made it known by his actions that he has higher callings – of being a brother, a son, and a philanthropist. No one-trick pony here. There is something very inspiring about all of this. Even with his priorities in order, I’m sure it hasn’t been easy and that he has missed important birthdays, weddings, and other family events…failing those closest to him many times over perhaps. To get to the highest level of anything requires sacrifice, and surely he isn’t perfect. But when you get beyond the reality of it all he has seemingly struck a balance that has allowed him to keep the important things in perspective while achieving greatness in his sport. A real rarity. There are many parts of myself that I want to develop. If I’m not careful, I’ll focus on one thing and one thing only; neglecting many other colorful parts of myself. Over the last decade or so I’ve been really immersed in the endurance and triathlon culture and have loved it. Where I can improve is in the sheer amount of attention I give to it, leaving space so that I don’t experience an incompleteness in other areas. When the clues presented themselves years ago I chose to ignore and “double down”, determined to stay focused and apply even more time and energy to the endeavor. The unfounded fear is that by giving up time in my core competency, that I’ll become weaker (in knowledge) and fall behind. By exploring other areas, I’ve found it has strengthened my mind and made me that much sharper in the areas where people rely on me the most. Being a one-trick pony reminds of Nicholson in The Shining, “All work and no play makes Jack a dull boy”! At least, that has been the case for me. Very few have mastered the art of balancing the pursuit of excellence with having an authentic, deeper sense of meaning and purpose. The key seems to becoming more aligned with your mission in life. Then with the right steering and direction, performance gains come easily.